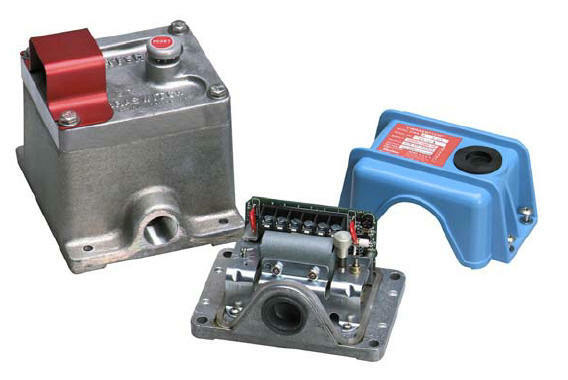 These Robertshaw Vibraswitch Malfunction Detectors are acceleration sensitive vibration instruments with electronic circuitry to provide maximum protection to rotating and reciprocating machinery due to damages resulting from mechanical malfunctions. Although identical in outside appearance and dimensionally the same as the existing Models 365 and 366, these instruments include built-in electronic circuitry for start and/or monitoring time delay functions for the prevention of false shutdowns resulting from transient vibrations. All models include provisions for remote reset. "Start Delay" is often required on machines that start automatically and exhibit excessive vibration for short periods of time only during starting. Proper set point adjustment on the Vibraswitch for adequate protection during normal running conditions may cause the Vibraswitch to trip as the instrument senses these high starting transient vibrations without the use of start delay. Examples of such machines are refrigeration compressors and high-speed turbines. "Monitor Delay" is required on machines that exhibit excessive vibration of a transient nature which occurs during normal operation. If a Vibraswitch without monitor delay has it's set point sufficiently high so as not to trip-out under the transient vibration levels; inadequate protection would result during the normal running conditions. Examples of this type machine include liquid pumps that experience momentary cavitations resulting in excessive vibration. Measures total destructive shock, not displacement. No moving parts except when set-point is exceeded. No attention required after installation. Instrument is rugged and durable - no wearing parts. Permits maximum application flexibility in operations with variable delay options. Alarm or Shutdown Voltage Completely Isolated from Instrument Supply. 904GB016-03 - Rainshield, steel, zinc plated and painted with gray epoxy enamel.